Bridges might not get the respect the world’s tallest skyscrapers get but these horizontal architectural wonders push the engineering envelope just as hard. 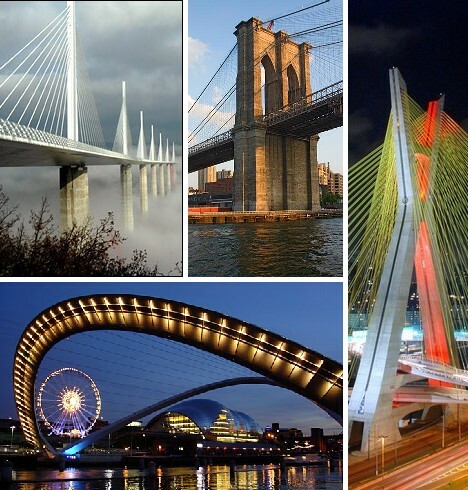 From “Galloping Gertie” to the Golden Gate, these 10 span-tastic bridges prove the journey is often more interesting than the destination. 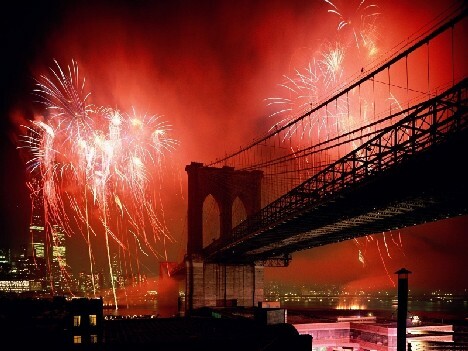 No worthy discussion of amazing bridges can ignore the grand-daddy of them all, New York’s Brooklyn Bridge. The 5,989 ft (1825 m) structure took 13 years to build, opening to great fanfare in 1883. For 20 years it reigned as the longest suspension bridge in the world. 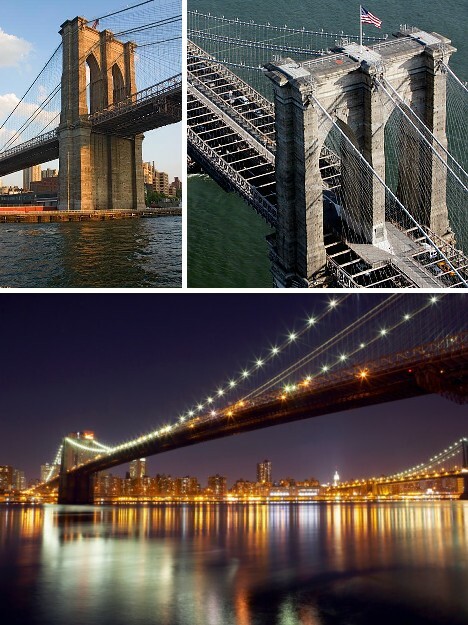 The Brooklyn Bridge was designed to be 6 times stronger than it needed to be. Even so, the public had doubts as to the viability of the bridge. Just one week after it opened for vehicular and pedestrian traffic, a rumor spread that the bridge was about to collapse: the resulting stampede caused 12 deaths. On May 17th, 1884, famous showman and circus owner P.T. 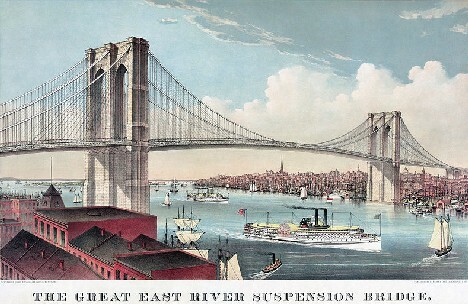 Barnum put the rumors to rest once and for all by leading a procession of 21 elephants across the bridge. Today’s big bridges are engineered with aeronautical principles in mind – if you think about it, the long deck of a bridge looks somewhat like a wing and in certain conditions acts like one too! 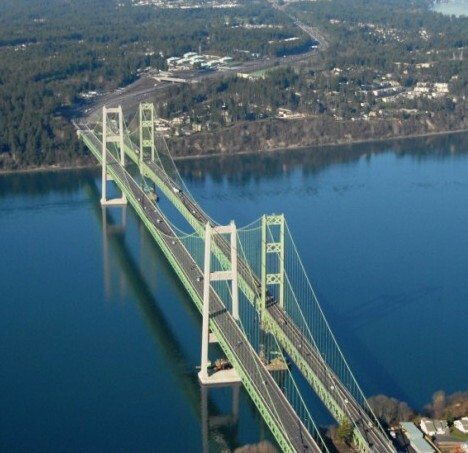 That’s today; yesterday is another story best told by the first Tacoma Narrows Bridge. 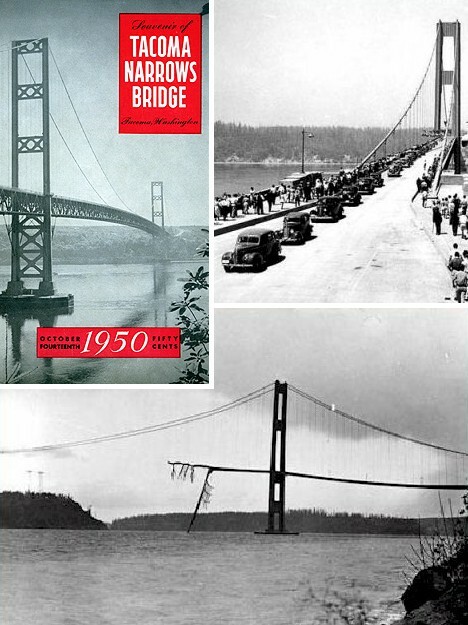 Opened on July 1st, 1940, the mile-long suspension bridge quickly garnered the name “Galloping gertie” due to the way the bridge deck oscillated in windy weather. On November 7th, just over 4 months from its opening, winds of 42 mph (67 kph) affected the bridge to such a degree that two cars in the midst of crossing were abandoned. Shortly afterward, Galloping Gertie shook herself to pieces and in the process, shook up the way future suspension bridges were designed and constructed. 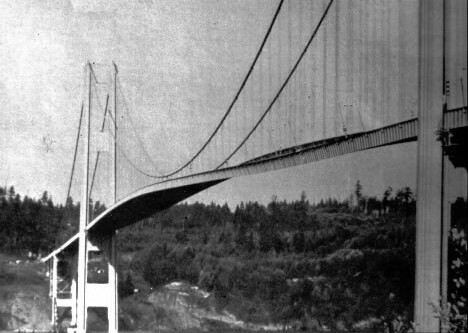 The Tacoma Narrows Bridge was rebuilt in 1950 and the original span was doubled with the completion of a nearly identical structure in 2007 – one serves eastbound traffic, the other westbound. Though the areas winds have remained constant, both bridges have held up well. 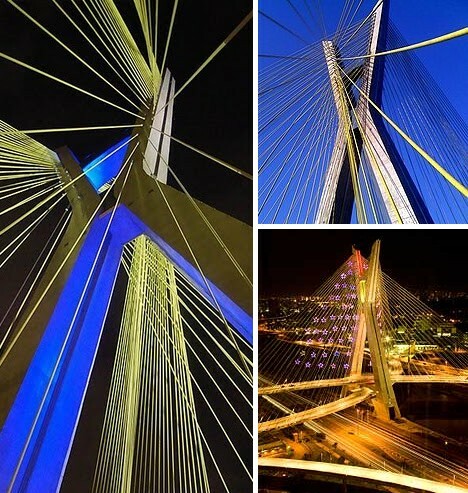 A stunning sight for the eyes, especially when lit up at night, the Ponte Octavio Frias de Oliveira in São Paulo, Brazil is the world’s first x-shaped cable stayed bridge with two crossed lanes. 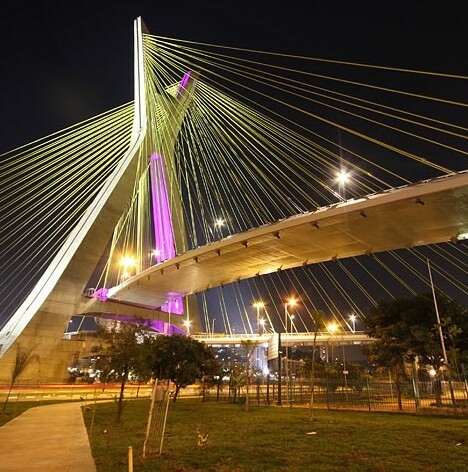 The 5,200 ft (1,600 m) bridge spans the Pinheiros River and was opened in May of 2008. 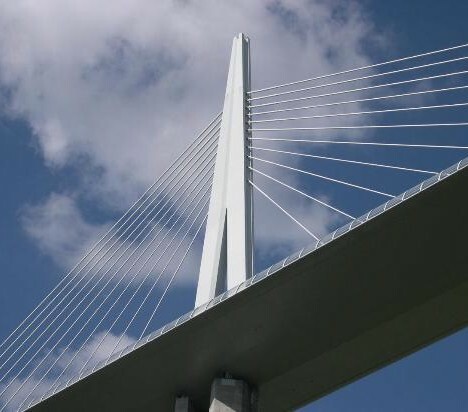 The design of the Octavio Frias de Oliveira uses a single concrete mast 450 ft (138 m) tall to support two curved decks that cross at the bridge’s midpoint. Each December, LED lights are set up on the bridge’s cables and a computer program is used to create a wide variety of colors and patterns. One might think the massive light show would be distracting to drivers but like most modern wonders, familiarity lessens the impact. 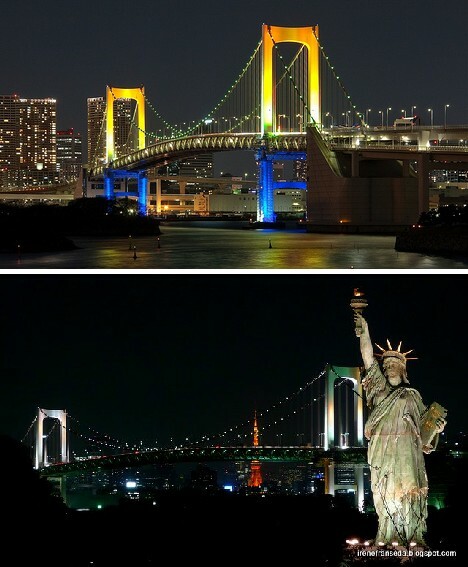 Standing out from Tokyo’s brilliant nighttime neon glow isn’t easy but the Rainbow Bridge accomplishes it with ease. Spanning Tokyo Bay from the Shibaura Pier to Odaiba, the 1,903 ft (580 m) suspension bridge was completed in 1993 and its name was chosen by the public. Oh, the Statue of Liberty? Not to worry, it’s just a replica! 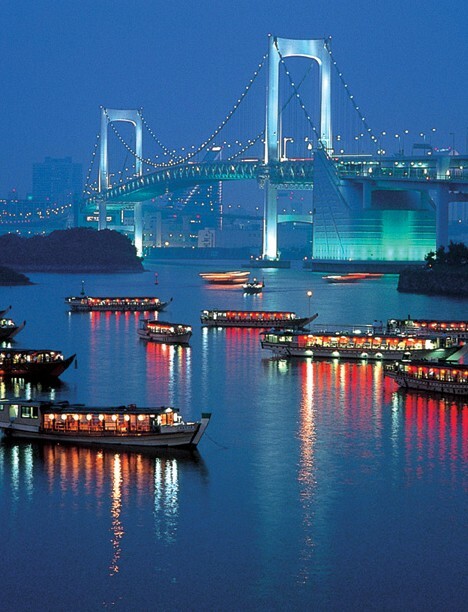 The Rainbow Bridge’s towers look white in daylight – the better to blend in with Tokyo’s dizzying skyline. 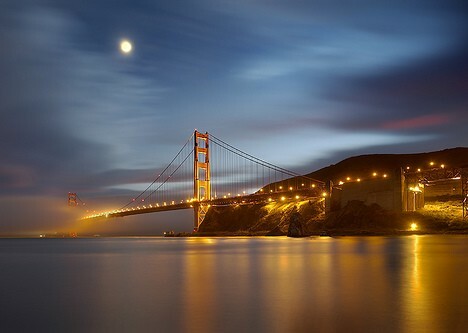 When the sun goes down, however, a lighting system on the bridge switches on and bathes the bridge in rainbow colors. Wasteful? Not at all: the system is powered by solar energy absorbed during daylight hours. 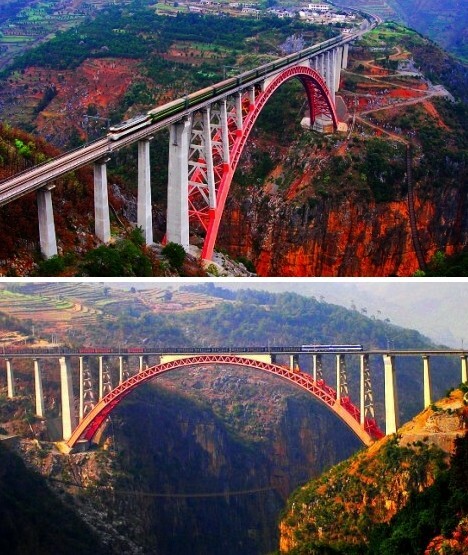 The Beipanjiang River Railroad Bridge in Guizhou, China, ranks with the world’s longest arch bridges but stands out due to its spectacular scenic beauty. The bridge, which opened in 2001, connects two mountains over a gorge 918 ft (280 m) deep. The bridge is a vital part of the Guizhou-Shuibai Railway Project and since completion, has boosted commercial activity and incomes in what has historically been one of China’s poorest regions. 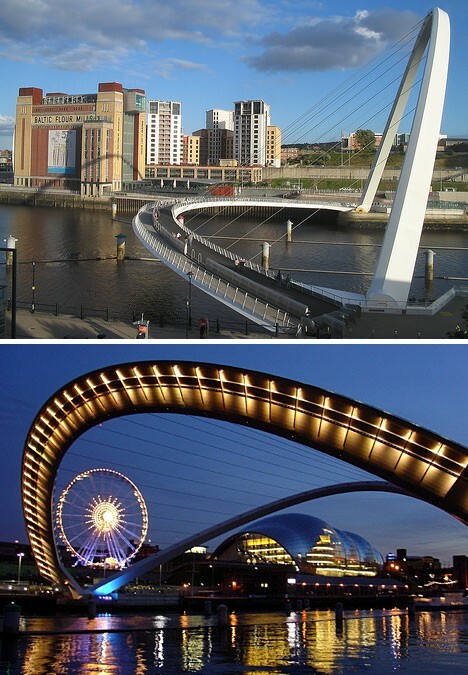 The Gateshead Millennium Bridge is often called the “Blinking Eye Bridge” due to its unusual method of operation. 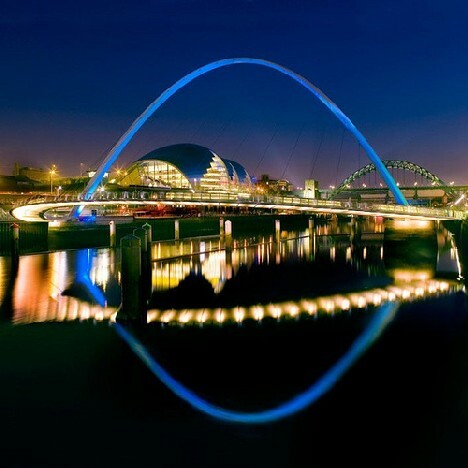 Located in Newcastle, the bridge serves pedestrian and non-motorized traffic moving from the tilt bridge spanning the River Tyne in England between Quays arts quarter to the south and the Quayside of Newcastle-upon-Tyne to the north. 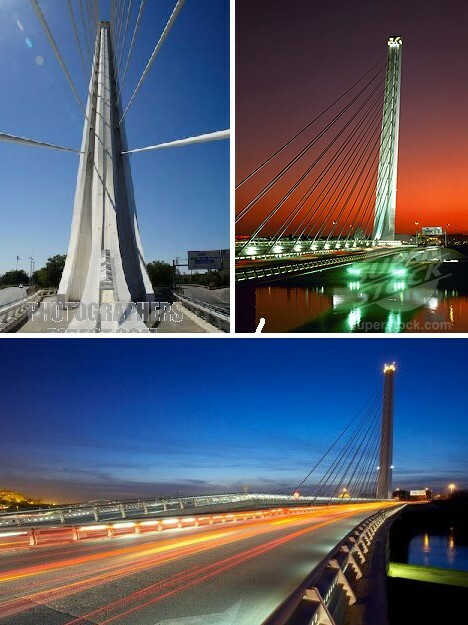 This beautiful “tilt bridge” was officially opened in May of 2002 and is 410 ft (126 m) long. Due to its smallish size and method of operation, the entire structure was set in place in one piece by a massive Asian Hercules II floating crane. 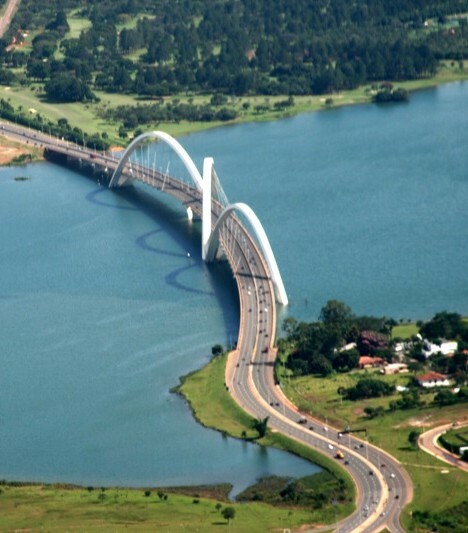 The Juscelino Kubitschek Bridge displays an appealing, modernistic design that complements that of Brazil’s master-planned capital, Brasilia. The bridge is considered to be an Asymmetric Arch Bridge with Suspended Deck, and it spans Lake Paranoá with a total length of 3,900 ft (1,200 m). 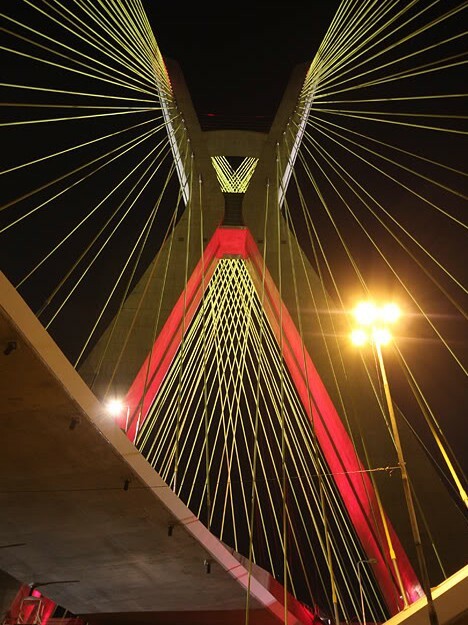 The bridge was designed by Alexandre Chan (architect) and Mário Vila Verde (), and is named to commemorate former president Juscelino Kubitschek de Oliveira. It was Kubitschek’s vision of a city of the future that sparked the creation of Brasilia, Brazil’s capital city, in the late 1950s. 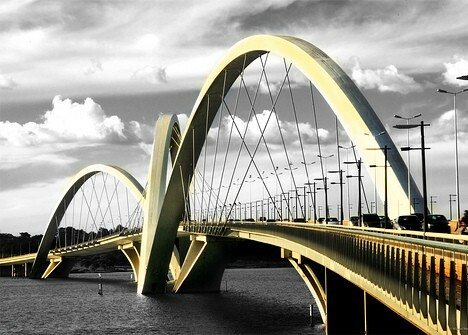 The Juscelino Kubitschek Bridge features three asymmetrical steel arches, each 200 ft (61 m) tall. Diagonal steel cables interlace to support the bridge, which is fully accessible to pedestrians, cyclists and skaters. Built for practical and aesthetic reasons for Expo 92, the “Puente del Alamillo” is a strikingly beautiful cantilever spar cable-stayed bridge that only has one pylon. Resembling in many ways a gigantic sundial, the bridge’s main pylon soars 465 ft (142 m) into the sky while supporting the 656 ft (200 m) long roadway with 13 pairs of cables. The Alamillo Bridge provides a vital transport link across the Guadalquivir River from the Spanish city of Seville to La Cartuja island, where Expo 92 was held. 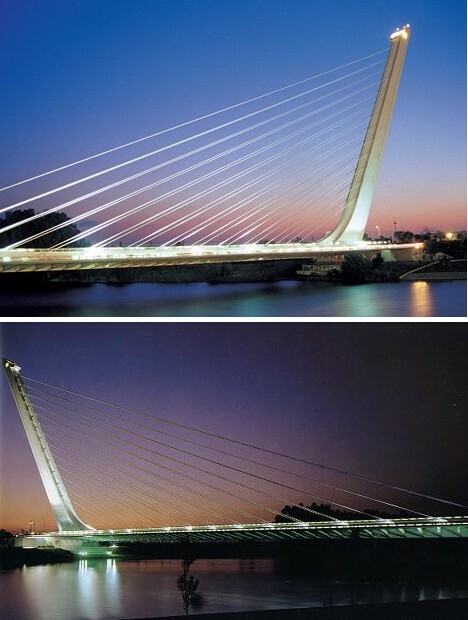 Since then, the bridge has become a landmark visible from most points in Seville and has come to symbolize the city’s promising future. 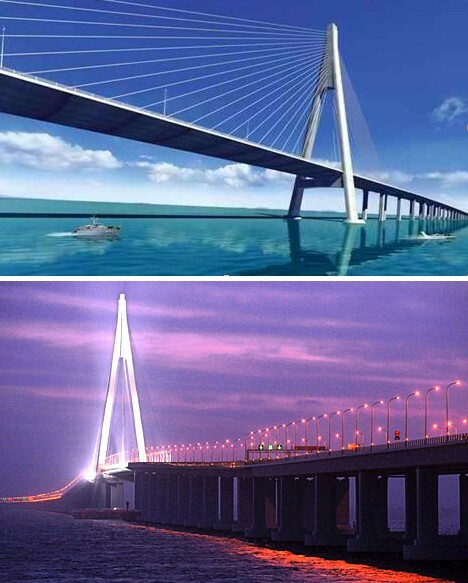 At 22 miles (35.673 km) in length, the Hangzhou Bay Bridge is the the longest ocean-crossing bridge in the world. 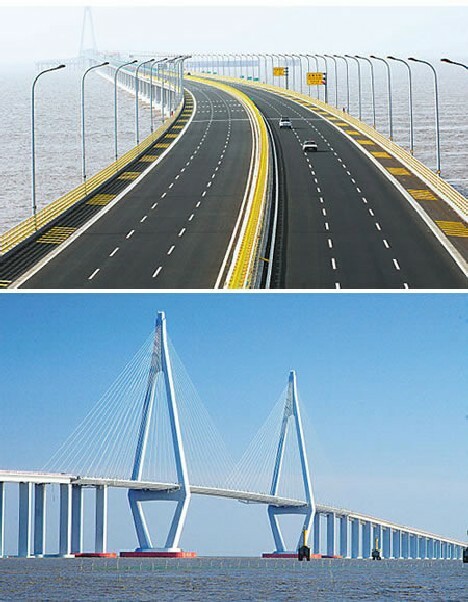 The bridge, which opened for public use in May of 2007, reduces travel times from the Yangtse River Delta area around Shanghai to the port city of Ningbo from 4 hours to a mere 2.5 hours. Some facets of the Hangzhou Bay Bridge are still under construction, most notably a 107,650 sq ft (10,000 sq m) service center which will occupy an artificial island built at the bridge’s midpoint. In order to avoid obstructing ocean currents, the island will be built on a platform resting on piers that will in turn rest on bedrock at the bottom of Hangzhou Bay. The Millau Viaduct (“le Viaduc de Millau”, in French) is not a sight those prone to vertigo or gephyrophobia (fear of bridges) will easily take in. The bridge, designed by Norman Foster (architect) and Michel Virlogeux (structural engineer), spans the River Tarn valley near the medieval town of Millau in southern France. The designers specially incorporated a sweeping curve into the layout of the bridge so that drivers crossing it would get a good view of the picture-postcard perfect town. At 1,125 ft (343 m) from its base to the tip of its tallest mast, the Millau Viaduct ranks as the world’s tallest vehicular bridge. To put that into perspective, the bridge is just a few feet taller than the Eiffel Tower and is only 121 ft (37 m) shorter than New York’s Empire State Building. 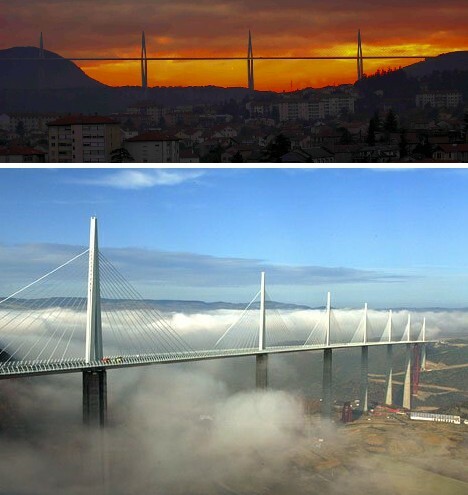 Drivers plying the route from Paris to Montpellier will cross the Millau Viaduct, which cost a whopping 400 million euros and which opened on December 14th, 2004. Bridges – before the Internet they were the best ways for people to make connections. Judging from these 10 amazing examples, they’ll likely retain that important function today, tomorrow and for countless years to come.